Based on the 2014 Ian McEwan novel of the same name, The Children Act tells the story of a judge who is asked to rule on the case of a teenage boy who refuses a blood transfusion on religious grounds. Source: ACOFB. The title refers to the Children Act of 1989 - a UK Act of Parliament, written to primarily protect the welfare of minors. Fiona Maye (Emma Thomson) is an eminent, well-respected judge in the High Court of Justice of England and Wales where she presides with compassion over ethically difficult cases in family law. One day, she is asked to rule on the case of Adam Henry (Fionn Whitehead), a young boy who has fallen ill. Adam is 17 years old, and still legally a child, being three months shy of the legal age of 18. He is suffering from leukaemia, and has been informed medically that he needs a blood transfusion to live. He and his parents (Ben Chaplin and Eileen Walsh), however, are Jehovah Witnesses and a blood transfusion is against their religion. Fiona inappropriately visits Adam in hospital and discovers an intelligent romantic adolescent, and they instantly bond together. She rules in court that he should be given a blood transfusion despite the fact Adam and his parents have not consented to it. The transfusion is successful and the hospital releases Adam, who becomes attached to Fiona and follows her around. He sends her poems that he has written, and he asks Fiona to live with him. Fiona is astonished that Adam is behaving in this way and will not leave her alone. She recognises Adam’s dependency, as well as her own lapse of judgement and co-dependency, and she tries to terminate their contact. In the midst of this turmoil, Fiona’s marriage of 30 years to her husband Jack (Stanley Tucci) is in deep trouble. They have no children, and Fiona’s decisions in life seem to Jack to be as final as those she makes in court. The film brings McEwan’s novel vibrantly to life. It addresses a variety of questions including the right to choose, respect for religious beliefs, the ambiguous line that can divide human perceptions of what is right and wrong, and the conflict between facing one’s emotions, and evidencing moral strength. This is a richly complex movie that is deeply satisfying. 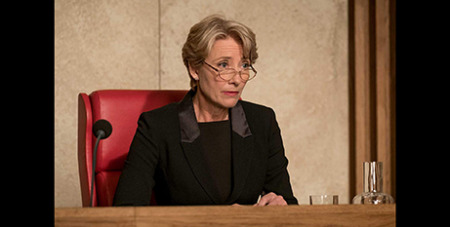 The Children Act: Starring Emma Thompson, Stanley Tucci, Fionn Whitehead, Ben Chaplin and Eileen Walsh. Directed by Richard Eyre. Rated M (Occasional coarse language). 105 min. In cinemas November 22.